BORN: 1829 in Lynchburg, VA.
DIED: 1864 in Winchester, VA.
CAMPAIGNS: First Bull Run, Peninsula, Seven Pines, Gaines' Mill, South Mountain, Antietam, Chacellorsville, Gettysburg, Spotsylvania, Third Battle of Winchester. Robert Emmet Rodes, major-general, C. S. Army, was born March 29, 1829, near Liberty, Bedford County, Va., and died September 19, 1864, at Winchester, Va.; son of David and Martha (Yancey) Rodes, the former who was always known as Gen. Rodes, was born in Albemarle County, lived in Lynchburg, was clerk of the court many years, and died in 1862; grandson of Matthew and Mary (Mills) Rodes, the former who was born about 1833 and died in 1893, and of Robert Yancey and his wife who was a Miss Harrison, the former who lived in Lynchburg; great-grandson of David Rodes. Robert Emmet Rodes obtained his early education in the schools of Lynchburg; attended the Virginia military institute, from which he was graduated July 4, 1848; following this was assistant professor in the institute for two years; was assistant engineer for the Southside railroad until 1854; then went to Marshall, Tenn., where he engaged in railroad construction; came to Tuscaloosa, in April, 1855, and joined the corps who were working on what is now the Alabama great southern. This work disbanded in the fall of 1855; went to North Carolina where he engaged in engineering; thence to Missouri; when work in Alabama was resumed he returned; in November, 1857, he was elected chief engineer of the lower portion of the N. W. and S. W. railroad from Jefferson to Meridian, Miss. ; held this position until 1861, and left because of military duties. In January, 1861, he was captain of the "Warrior Guards;" led the company to Ft. Morgan, remaining there until February when it returned to Tuscaloosa; when Ft. Sumter fell, Capt. Rodes offered the service of the company to the governpr of Alabama; early in May he was ordered to report at Montgomery with his company; on May 5, at Montgomery the Fifth Alabama was organized, Capt. Rodes being elected colonel of his company. The regiment reported to Gen. Bragg at Pensacola; a few weeks later went to Richmond and took a position near Manassas Junction in Gen. Ewell's brigade; the brigade was not actively engaged in the first battle of Manassas. 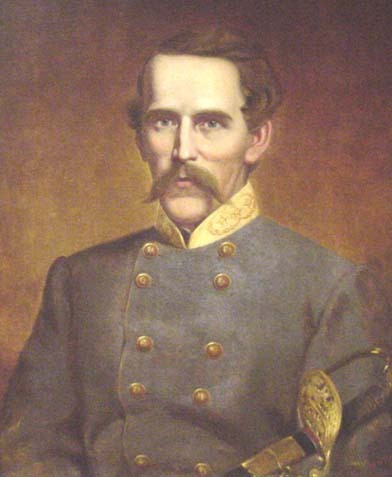 On October 21, 1861, Col. Rodes was commissioned brigadier-general and assigned to the brigade composed of the Fifth, Sixth Twelfth Alabama, the Twelfth Mississippi regiment and the King William, Virginia, Artillery; led this brigade at Williamsburg and at Seven Pines, May 31, 1862; in the latter battle he received a severe wound and was compelled to turn over his command to Col. Gordon. Not long after the battle of Seven Pines the Twelfth Mississippi was detached from the brigade and the Third and Twenty-sixth Alabama were added to it. With his wound still unhealed Gen. Rodes led his brigade of 1,460 men at Haines' Mill, June 27, but near the close of the day because of the condition of his arm and the consequent sickness, he was again compelled to turn over his command to Col. Gordon. Gen. Rodes was in the Maryland campaign, at the Battles of Chancellorsville, Gettysburg, the Wilderness, Spottsylvania and the second Cold Harbor; when Early retired from Maryland, Gen. Rodes repulsed the foe at Castleman's Ferry, and Kernstown; and it was at Winchester, September 19, 1864, that he was struck behind the ear by a fragment of a shell and died within a few hours. Married: September 10, 1857, in Tuscaloosa, to Virginia Hortense, daughter of David and Eliza Antoinette (Bell) Woodruff (q. v.); the former who was a prominent bookseller in Tuscaloosa, and was born September 29, 1798, in Connecticut and the latter who was born April 30, 1811, in Norfolk, Va., lived near Winchester some years; moved to Shelbyville, Tenn.; went to Tuscaloosa in 1827 or 1828 to take charge of a female institute; was married October 29, 1829; d: December 18, 1884. Her ancestors came from England in 1620 and the homestead built in 1640 by Matthew Woodruff, her great-great-great-grandfather was, until its destruction by fire, a notable landmark in Connecticut. Children: 1. Robert Emmet, b: September 30, 1863, m. March 21, 1896, to Birdie L. McKinnis; 2. Bell Yancey, b: January 11, 1865, m. R. J. Treanor, in June, 1884. Last residence: Winchester, Va.